I’ll be the first to admit that I can’t sew – not to my grandmother’s exacting standards anyway. She who used to make her own doilies, tablecloths, clothes for her children and also was a marvel at needlework. Sadly those traits aren’t hereditary not do I have the slightest desire to pick up a needle. But to re-arrange, paint, stick and create something utterly fresh from bits and bobs – oh yes, that’s me. 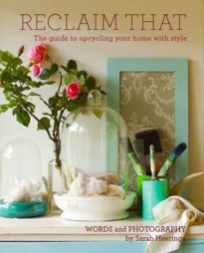 So when I picked up Sarah Heeringa’s Reclaim That I was genuinely quite excited. Not just for the suggestions she was making but for the sparks that started to fly as I flicked through the pages. Upcycling takes things potentially to a new level, and perhaps you’re already there – jam jars for drinking glasses (they’re so trendy contestants on My Kitchen Rules even use them for serving up everything from drinks to soup); old crates or pallets for impromptu vertical drawers or even shelves; and of course, the compulsory French chic rustic look which for some doesn’t really need too much effort other than rummaging again through the family hoardings and applying a lick of paint and a dab of love. Heeringa’s photos are inspiring, the walls of text that appear opposite less so. This is especially the case if you’re a greedy reader who simply wants to make it NOW! Nevertheless it is a book you can dip into again and again. Her section on lights and mirrors is good but I wished there was more examples and detail, similarly with the section on reclaiming metal. Her recommendation for ‘attractively ordered clutter’ is also a good reminder that before you go on a wild second hand shopping spree you do think about what spaces you have and what you intend doing with them. For some transforming old wicker furniture with some brazen blue paint or simply adding a wheelbarrow garden to your outdoor entertaining area might be far more easily done in you live out in the burbs with an abundance of bush and outdoor space but if you’re in the city in a shoebox your projects and their sizes need to be equally innovative so you don’t end up just adding more ‘stuff’ to your pint sized palace. It’s a handy and visually attractive book, well written but could have been improved with regular tips and tricks and even a few favourite local stomping grounds (aside from the published resources at the back) to pick up a few treasures. Well, that’s enough for now I’m off to frame a mirror with jewellery I don’t use anymore – I knew I was keeping it for something special!